The Jerusalem Quartet has assembled an impressive discography for Harmonia Mundi, the label for which they record exclusively, and their discs have garnered much praise. The breadth of their recorded repertoire is wide-ranging, including Haydn, Mozart, Brahms, Dvořák, Smetana, Janáč ek and Shostakovich. I'm only familiar with the 2004 release of the Haydn Quartets Opp. 64 no. 5, 76 no. 2 and 77 no 1 (HMC901823). I find the Jerusalem's performances spirited and full of personality. Now it is tackling Beethoven, and I hope that this new release of the Op. 18 String Quartets will be the beginning of a complete cycle. Although Beethoven was heavily indebted to Haydn and Mozart, whose quartets he must have known, in the six Op. 18 Quartets he begins to find his own voice whilst, at the same time, utilizing some of the conventions of the eighteenth century. By the next set, the revolutionary Op. 59, that unique voice would be firmly established. The F major Quartet was the second of the set to be composed, but placed first when published by Beethoven himself. A larger-scaled work than no. 3, it has greater emotional range and impact. 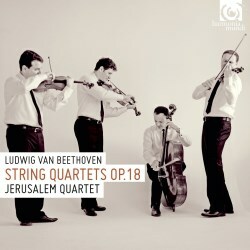 The Jerusalem Quartet, has, unusually, maintained the chronological sequence in this recording, and uses modern instruments, which suits me down to the ground. The quartet confer a Haydnesque charm on the F major and G major works. The playing has personality, elegance and refinement and a certain suavity. Phrasing and articulation is instinctive and intuitive, and great attention is paid to detail. Nothing is forced, everything emerges naturally with spontaneity and freshness. The slow movements are expressive and lyrical and, in the G major especially, there is a heartfelt tenderness. The Scherzos are rhythmically buoyant and exuberant, and the finales are affable and delivered with polish and refinement. The C minor is my favourite of the set. The dark, brooding opening movement has tension and dramatic intent and, in this quartet's hands, is quite unsettling. I particularly like the driven quality the quartet brings to the music. The Andante scherzoso is delicately articulated, nicely paced and relieves the tension somewhat. We return to a dark restless mood in the Minuetto, and the trio's syncopations are invigorating. The finale is playful, sprightly and tongue-in-cheek, with a real gypsy flavour. If Beethoven gives a reverential nod to Haydn in the first two quartets, no. 5 gains its inspiration from Mozart's quartet in the same key K. 464. The first movement is both bold and athletic, with the spotlight on the first violin for much of the time. Alexander Pavlovsky acquits himself admirably with panache and flawless intonation. Throughout the movement there is a congeniality of sprit. In the third movement Andante, the variations are well-characterized, and in the finale the contrapuntal writing is delineated with pristine clarity, and dispatched with fire and energy. I'm very taken by the warm, intimate acoustic of the Teldex Studios, Berlin, and the superb instrumental balance struck. It is hard to believe that the group have been playing together since 1993, and on the evidence of this they are team players par excellence. If this, as I hope, is the first instalment of a complete cycle, then the omens look favourable indeed.